Folksmen, The: Aging folk band reminiscent of the Kingston Trio that was scheduled to open for Spinal Tap during the 1992 Royal Albert Hall show. Instead, they played a nearby Tube stop for change because roadies feared the energetic heavy metal crowd would tear them to pieces. Four years later, according to the Tap Web page, the group signed a four-month lease on a 1994 Chrysler minivan in anticipation of Taps never-realized 1996 Third World Tour. Rumor had it the trio might put out a CD. From the Web page: "Perhaps best known, if at all, for their 1962 Top 70 hit Old Joes Place, the Folksmen have earned a lasting place in folk music history as the group too popular to be purist and too purist to be popular. Jerry Palter, Alan Barrows and Mark Shubb met as freshmen at Ohio Wesleyan and over the next 26 months played and sang their own brand of eclectified folk music. Recently reunited after more than two decades, they are again becoming a popular late addition to folk festivals within a days auto travel of their homes." 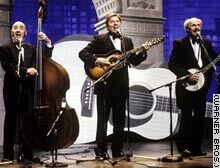 A later Folksmen reunion was chronicled in the documentary A Mighty Wind.